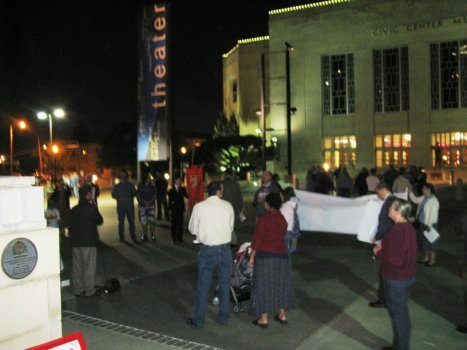 On Thursday, October 21 a public satanic ritual was performed at the Civic Center in Oklahoma City, Okla. The ritual was billed as a mockery of the Catholic Rite of Exorcism rather than what it really was—a satanic ceremony performed in public. Around thirty-five dedicated Catholic souls stood with TFP and America Needs Fatima to offer a public rally of reparation for this sacrilegious and blasphemous event. A ritual like this would have been horrendous no matter where it took place, however for it to have occurred and been accepted in a place such as Oklahoma, says a lot about the direction our nation is heading. Sadly lacking, was the kind of public outrage and indignation this event deserved. Those present at the rally were certainly willing to make an effort to have their voices heard. One gentleman by the name of Juan took time off from work and traveled all the way from Fort Worth, Tex. to participate in the rally. He brought with him a sign containing the entire prayer to Saint Michael the Archangel. Another couple traveled from McKinney, Tex., almost as far. There were protesters from Arkansas, as well as from Topeka and Wichita, Kans. Some of those who came to protest told us they were afraid to attend the rally, however, we must have the certainty that Our Lady is infinitely more powerful than the devil. This is truly an unfair battle. Those fighting for Our Lady have little to fear. Our Lady and Her legions of angels watch over and protect us. The only weapons needed were the rosary, holy water and holy medals. Hale claimed to have sent out some 70 tickets for the event. Only half of those alleged to have tickets actually showed up. He then claimed that some of the ticket holders didn’t show up because of the crowd outside of the building. How did they know about the crowd if they didn’t show up, perhaps the rosaries scared them off. Who says that protests are not effective? Imagine if that square had been filled with protesters, probably no one would have had the courage to attend even by way of the back door. Evil advances only when the good fails to stand up to it. The square should have been filled with outraged Catholics. Actually, hundreds of thousands of Catholic should have expressed their outrage at the announcement of a public satanic ceremony. If that had happened it is plausible that the event would have been cancelled. As often happens the victories of the Church are left to the few who love Our Lord and Our Lady more than anything. Such describes the faithful who participated in the rally of reparation. Blessed be the happy few who stood with Her that night, because in reality, Our Lady defeated Satan and his minions long ago. 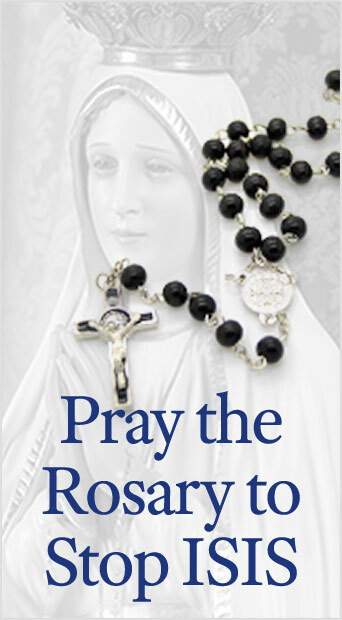 We pray for the final victory and triumph of the Immaculate Heart when the Catholic multitudes will indeed stand up en masse for the rights of God. A cackle, laced with hatred and lacking in conviction, was muttered upon departure. 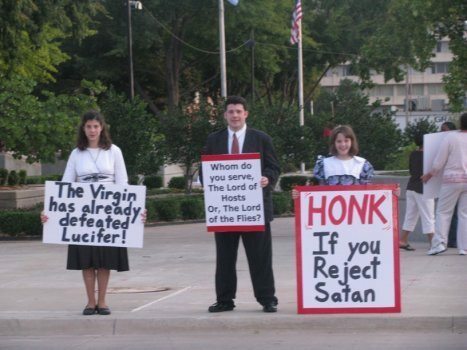 As some of the protesters were leaving, three satanists walked by and shouted, “long live Satan.” A protester loudly proclaimed, “Ipsa Conteret” from the book of Genesis, which means, “She shall crush.” The satanists attempted to repeat their cry, and each time the protester repeated the same. Finally, one of the satanists asked what does Ipsa Conteret mean. When she was told, they all became silent and continued walking down the street. When confronted with truth, evil has nothing to say. 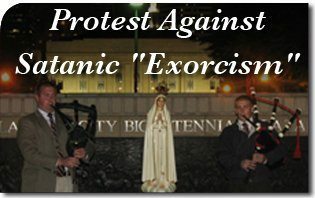 This entry was posted in Fighting the Culture War and tagged America Needs Fatima (ANF), American Society for the Defense of Tradition Family Property (TFP), blasphemy, Catholic Rite of Exorcism, Civic Center, Francis Slobodnik, good vs evil, Ipsa Conteret, James Hale, Oklahoma City, public, rosary, sacrilege, satanic ritual, The Oklahoman by Francis Slobodnik. Bookmark the permalink.